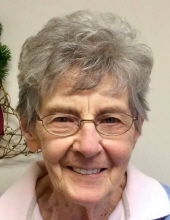 Thelma Markel Trail passed peacefully on April 4, 2019 at OhioHealth Mansfield Hospital. Born December 29, 1931, she was the daughter of the late Daniel Markel and Nannie Parmon Markel. Survivors include: daughter, Debra Hofacre of Mansfield and son, Timothy (Cynthia) Trail of Charles Town, WV, daughter-in-law, Doris Trail of Mansfield; sisters, Iva Swineford of Ashland, OH and Roberta Fletcher of Mansfield; sIsters-in-law Janice Markel, Betty Markel and Margie Little; grandchildren, Matthew (Kristina) Hofacre, Thomas Hofacre, Joseph Hofacre, Brandon (Angie) Clair, Lauren (Luke) LaBruyere, Howard (Janet) Trail, Elissa (Michael) Daley, Cody (Alicia) Trail, Brandie (Doug) Meador; great grandchildren, Brenden, Bryan, AJ and Jenna Hofacre, Taylor James, Miranda Daley, Danielle, Samuel, Alexander, Elliott, Abigael, Hannah, Emma, Bristen and Whilloh Trail, Sophia Clair, Raelyn and Riley LaBruyere. She was preceded in death by two sons, Alan and Gregory Trail; five brothers, Jasper Jackson, Willard Jackson, Max Markel, Robert Markel and John Markel; and three sisters, Elizabeth Trisler, Edith Ison and Ada Ashton. The family will receive friends April 13, 2019 at 1PM with a memorial service to follow at 2PM at the Calvary Chapel Mansfield, 1945 Pavonia West Rd. Mansfield, OH, (formally, Pavonia United Methodist Church). In lieu of flowers, memorial contributions may be made to your local hospice. To send flowers or a remembrance gift to the family of Thelma Trail, please visit our Tribute Store. "Email Address" would like to share the life celebration of Thelma Trail. Click on the "link" to go to share a favorite memory or leave a condolence message for the family.